You don’t have any power at the venue of your event? No problem, we can supply a generator from $100 plus GST. There’s nothing more satisfying than hitting the bullseye and watching your friends or colleagues – or even better, the BOSS! – drop into a tank of water! With our dunk tank hire packages Active Games and Entertainment can supply and set up your dunk tank for your next party, event, or corporate function. The best part? It’s fun for all ages! Active Games and Entertainment is one of Western Australia’s premier suppliers of party games and inflatables such as dunk tanks, sumo suits, bouncy castles and more. Whether it’s a bouncy castle for a kids’ party, a big chess set to encourage team bonding, or a giant inflatable obstacle course for some active fun, Active Games and Entertainment has a range of additional equipment, alongside our dunk tanks, for hire that can keep your guests entertained for hours on end! Remember, our inflatables and giant games aren’t just for entertainment; many of our clients use them for team building, icebreakers, skill testing, and promoting positive social interactions. Whether it’s a private backyard party or a national corporate conference, Active Games has you covered with great games, inflatables, and fantastic fun! Watch Your Friends and Colleagues Get the DUNK! Choose from two of our popular dunk tanks for your next party or function – the classic Dunk Tank and the Big Splash Dunker! One of our most popular attractions, the Classic Dunk Tank sits one of your friends or colleagues (or your teachers or the Boss!) above the dunk tank, nervously waiting for a ball to hit the target – once it does, in they go! Watch their face in the window at the bottom! 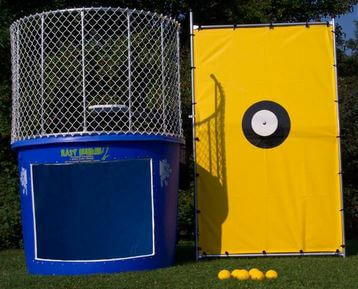 We recommend adding ice into the dunk tank for some surprising reactions! With our dunk tank hire we supply six balls and our price includes setup. Both the Classic Dunk Tank and the Big Splash Dunker require a nearby water supply to fill. With both our dunk tank hire packages, the price includes delivery and set up within a 10km of Leeming, so that you can sit back and relax! Are you located further than 10km from Leeming? No worries – we can deliver across Perth with an additional charge of $2 plus GST per km. Our Dunk Tanks are as safe as possible, making sure that everyone has hours of fun. Enjoy Our Games, Zorb Balls, Inflatables, and More! Want more party fun? We supply and set up other party games such as bouncy castles, water slides, zorb balls, sumo suits and much much more! Make sure to take a look at our fantastic range of fun inflatables and games for all ages! 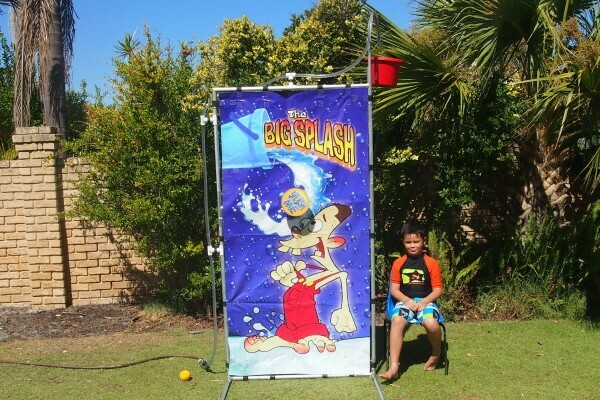 Do you want to make a splash at your next party or event in Perth? Contact us on 0411 140 249 or 1300 834 346 to get a quote on our Classic Dunk Tank or the Big Splash Dunker today! Alternatively, you can email us at info@gameshire.com.au.